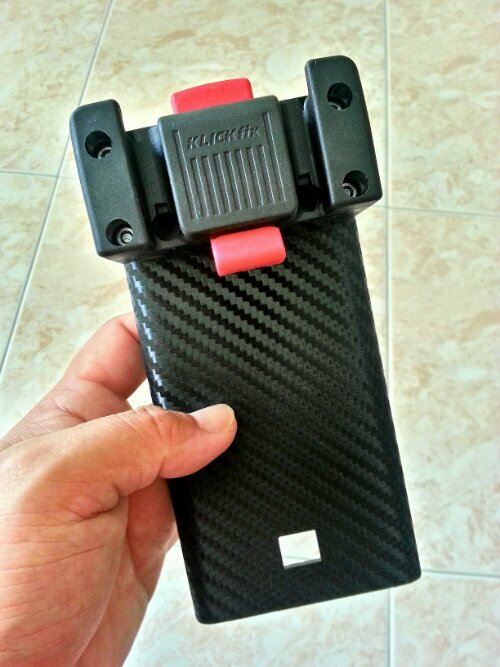 Placed an order for 2 pieces of Brompton block to Klickfix adapters. After waiting for 3 months, having it resent twice and 1 missed delivery, it is finally in my hands. 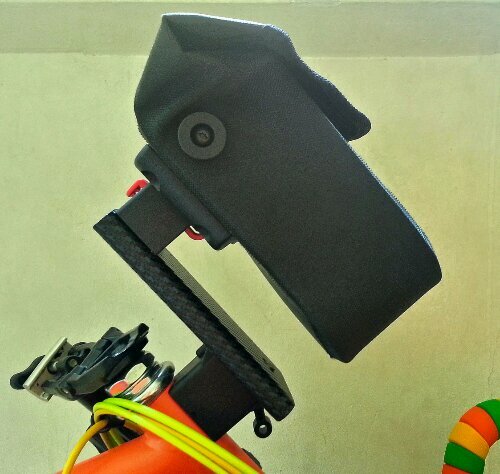 How it looks like when attached to the Brompton block and a Ortlieb Compact handlebar bag is attached to the Klickfix adapter. These adapters were custom made in Germany, from scratch using resin. A very solid feel to it and it gives you the confidence to load the front bag with items. Some users have stated they have placed up to 15 pounds of items in an Ortlieb 5 Classic handlebar bag attached to this adapter. With this adapter, it certainly opens up more configurations for my Ortlieb bags. Going to find a chance to use it on one of the rides. Returned from the much needed trip on Monday. Probably due to too much moving about, almost fell sick and slept through the entire Tuesday. Had an entire day of medical appointments on Wednesday and back to work today. To round off the trip, the last leg was to Sarawak. 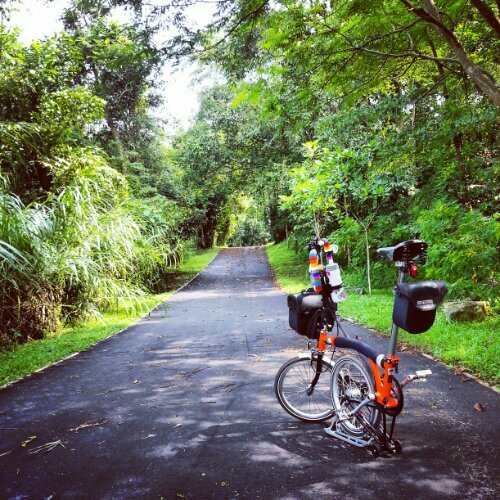 It would be a wonderful experience to cycle in Sarawak, with the relatively less congested roads. Saw a couple of leisure cyclists on road bikes and MTBs. Typical heavy traffic in Jakarta in the morning with everyone heading to work. 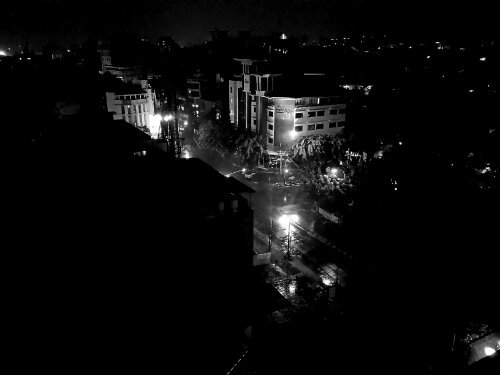 The streets of Jakarta in the early hours of the morning. 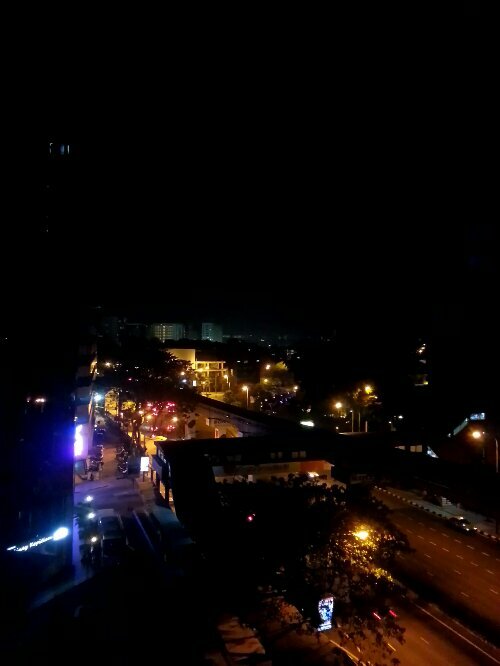 The streets of KL just past midnight. 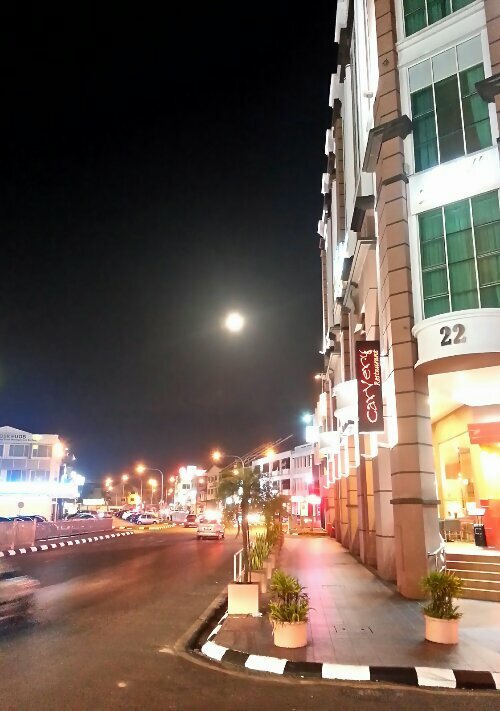 A street in Kuching in the early hours of nightfall. 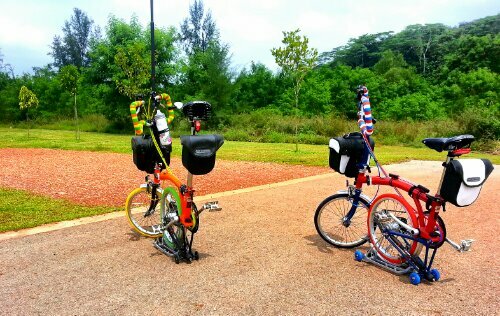 My wife and I are toying with the idea of returning to Sarawak with our Bromptons to explore the place. Hopefully it is possible in the months to come. Till then, back to the daily grind. Left Sg for a visit to 4 neighbouring cities for a much needed break. At the same time also to recce the possibility of cycling in these cities. Thus far, I have seen cyclists in Bandung, with some of them mountain bikers cycling downhill and some cycling to work. Jakarta and KL are out of the question with the extremely heavy road traffic. Let’s see what Sarawak has to offer to cyclists. Planned to cycle to work this week as it is a week packed with meetings in the office. Bought this last week when I collected our Bromptons as I knew it will come in handy at my workplace. 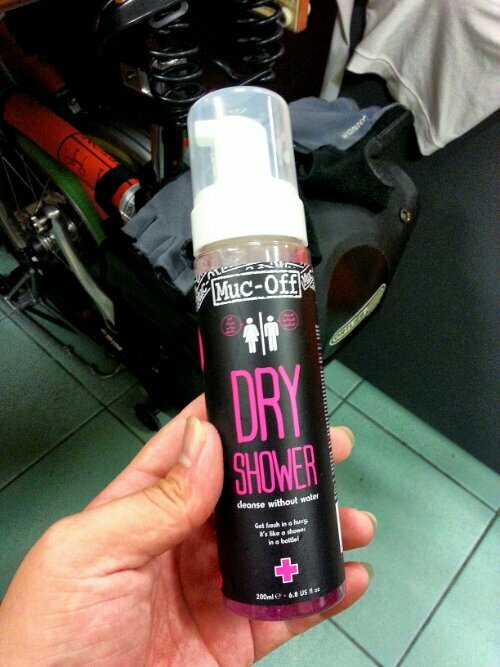 Used this today to freshen up upon reaching workplace. It is foamy and upon application onto the skin, it is immediately absorbed by the skin. At first, it gives off a buttery aroma. Once it is dried, the buttery aroma fades away. Most importantly, it keeps me fresh, as though I have just had my shower, and there is no feeling of sweat and stickiness on me at all. My wife and I woke up very early yesterday to make the most out of the morning to explore a scenic route that stretches 30-odd km to and fro. Upon arrival, this scene greeted us. And moments later, it poured. No way we can ride if it’s pouring. So we headed for breakfast. By afternoon, the sky had cleared and because we had already moved away from the initial route, we went to explore the estate which we will be moving to soon. 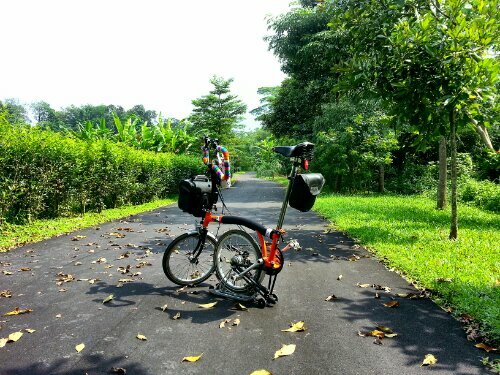 Our Bromptons with the upgraded Jagwire cables and Tannus puncture-proof tyres. Since we are already on Tannus, my wife decided to test if these tyres live up to its reputation. Well, it did. On this red-graveled path, more effort is needed to cycle. Ride is firmer too as the polymer used to make Tannus is less bouncy than rubber tyres. Once we rejoined the tarmac, it was a fantastic cycling experience. 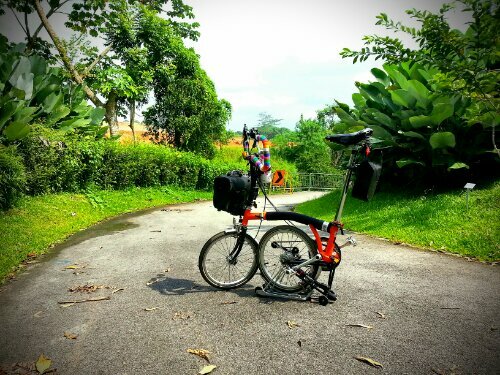 Our Bromptons feel as if it is gliding along the road. It is also considerably less bouncy. No doubt more effort is needed to cycle due to higher rolling resistance, but once it got rolling, it was wonderful. Before we headed back due to the need for our presence urgently, I took two shots of our Bromptons up close. My wife’s Brompton, named Dr Seuss. The colour combo was what inspired her with the name. 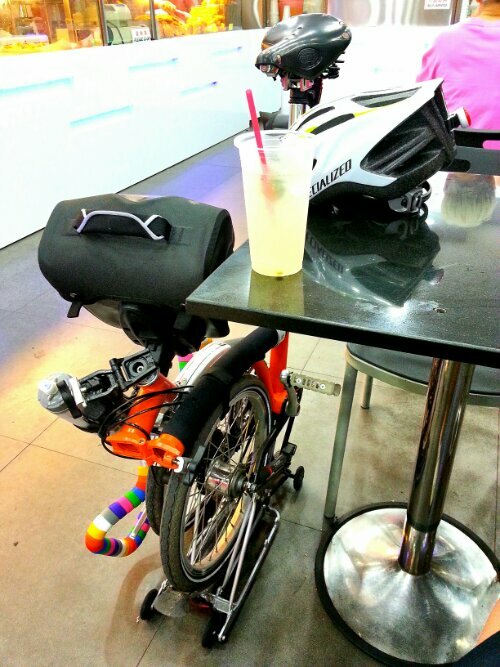 My Brompton. Wife named it Mr Citrus, after the colours of a lemon, lime and an orange. 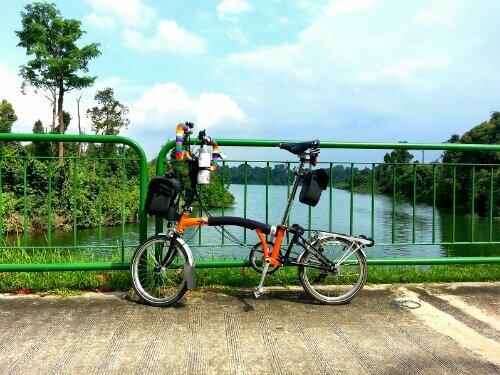 So now, with our Bromptons back and almost fully modded, I am definitely looking forward to more explorations and adventures on them. Finally, our pre-ordered Tannus tyres have arrived. We were told that the Bromptons have to be left at the shop for 3 days for all installations to be done. Besides the Tannus tyres, we also changed the stock cables to Jagwire cables. A sneak peek of the mods done in this round. 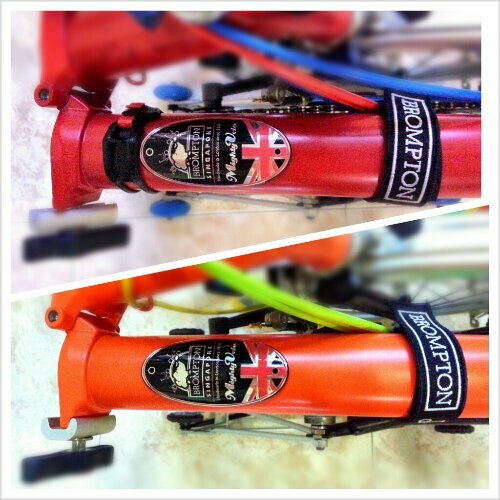 Head badge and velcro strap specially designed by the local distributor and Jagwire cables. The Tannus tyres could not be seen in this image. Will post some images of the Tannus tyres in the next post. Last Saturday, I went to recce a new route which one of my friends had gone on. I knew the route will loop back to my place. So off I went. At the beginning of this new route, I realised that even though it was next to a busy highway, it was surprisingly quiet from where this image was taken. Was quite glad that it was straight up to a point where I met my nemesis, up slopes. 4 to be exact. By the time I reached this point, I was faced with the 4th and steepest slope. Once I cleared this slope, it was downhill all the way. And what an exhilarating downhill ride it was. Achieved speeds of up to 40km/h. Once I rejoined the main road, it was road cycling all the way. Along the way, stopped by here for an image opportunity. The clouds were gorgeous on this day. Along the way back, stopped by a small eatery for a cup of lemon lime to quench the thirst and hide from the scorching sun for a while. Little did I know that the storm clouds were coming in. 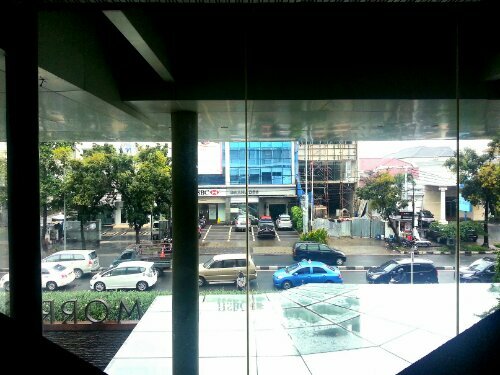 Managed to reach a shelter before the downpour started. 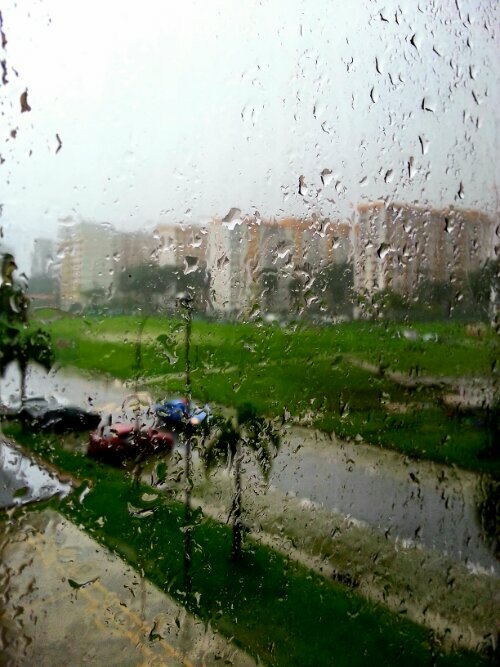 It was so heavy that the windows were pelted relentlessly by the rain. Nonetheless, it was an interesting ride out that afternoon, with lots of new discovery.